We have over 5 decades of experience in the safe and compliant transportation of all classes and divisions of Hazardous Materials. Including but never limited to explosives. We have a completely new fleet of very diverse equipment and trucks with exceptionally trained and vetted drivers. We can provide teams or solo trucks to meet your every need or schedule. 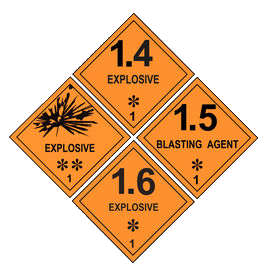 We specialize in the transportation of all Division 1 Explosives for Commercial Markets and the Department of Defense. We can transport your full truckload shipments or we also specialize in the small (LTL)explosive shipments using Dromedary boxes.